The higher the boys get, the more nervous I get about messing up their education. I know I am not the only Homeschool mom that feels like this. I also have a full plate educating four different school levels, all with individual areas of special need. 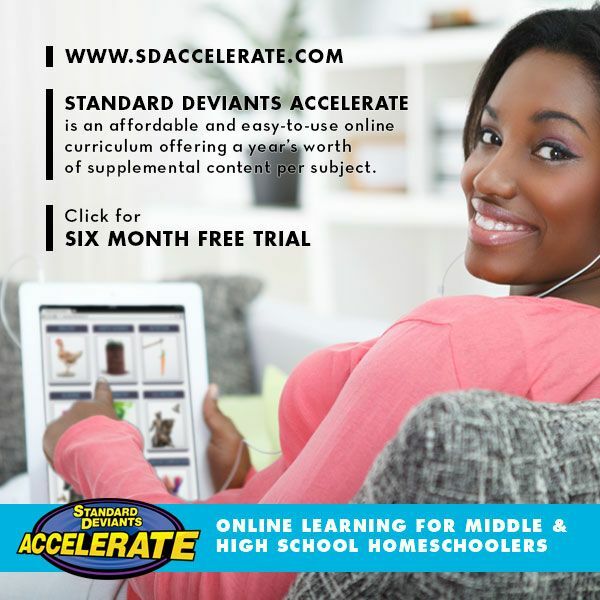 We were given the opportunity to review Standard Deviants Accelerate Homeschool Courses from Standard Deviants Accelerate. I was intrigued at a program that provided so much information in visual format. Something that our boys really need. The Standard Deviants Accelerate Homeschool program offers 14 subjects that take students through a complete course of study at their grade level in subjects of your choosing. Grade ranges are 3rd grade though high school. The program uses short videos that are down to earth to teach students and make learning more fun. They try hard to make book learning more fun and easier for the kids to understand. 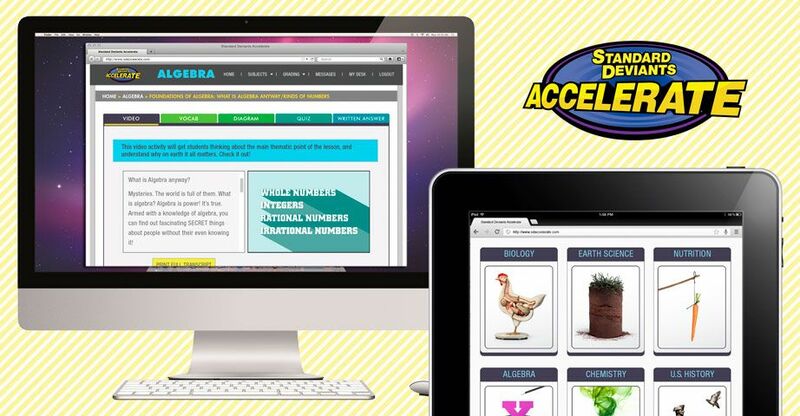 Students can use Standard Deviants Accelerate Homeschool Program to teach and even re-teach or refresh students in skill areas where they are struggling. 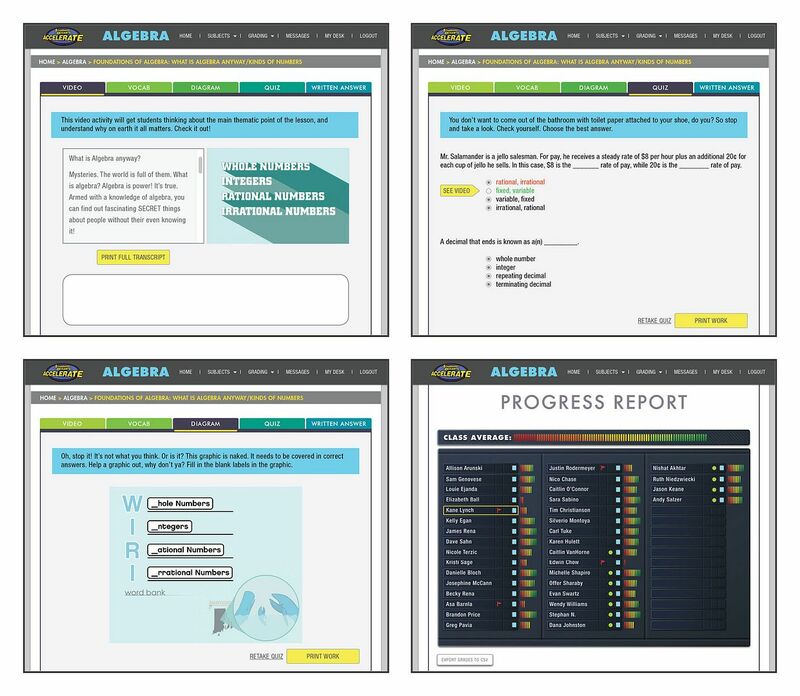 It allows students to progress to the point of mastering a subject. The best part is, there is little or no extra planning needed on your part as the parent. All the work is done, parents simply assign out the lessons. Grading is done for you and you have access to the score through your parent account. Students receive feedback and you can easily check their progress. Each class is broken down into a video lesson, vocabulary explanation for that lesson, charts and diagrams that go along with it and then an online quiz. At the bottom of each page there is a note taking section where students can jot down what they want to and need to remember. If you need, you can also print the full topic. Materials are available for students as young as 3rd grade through high school. The pricing for Standard Deviants Accelerate is affordable, it's $24.95 a month per course for student or $99.00 a year. AP courses are $14.95 a month. How has it worked for our family? 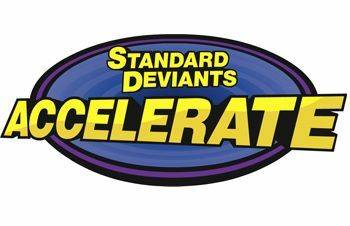 I have to say I really like Standard Deviants Accelerate. With me balancing so many different levels, and the boys really benefiting from a video lesson approach, this program has really worked out for us. We have been using the US History, the Earth Science and Nutrition programs. I plan on adding in Fundamental Math for Brayden by next month. He needed to tweak a few skill before advancing. I add what sections need to be completed on the boys weekly to-do list. I will also read over the notes for the assigned lesson so that I know what they are learning about. This allows me to ask them questions and know that they are retaining the information. I can also think of extra hands-on projects that they can do to really help them retain the material they are leaning. Under my parent login, I can easily check on quiz scores and check their progress. Much to Brayden's dismay, he doesn't like the record of me being able to check and see if he actually did do the work he was assigned. I am impressed with each level of the lessons. They really do provide a great amount of information. I don't remember tackling this information when I was in school. Our US History class was never that intense when I was in high school. I was in college before I really studied US History in-depth. It is actually above Brayden's abilities to finish a full lesson each week and fully understand the information that is presented. That may sound bad, but remember he is delayed. So the information is great!!! I know I am enjoying watching his classwork on his shoulder. The Nutrition class is very impressive. It breaks food down past the basic food groups and really makes the students dig in and see why we need to eat and what we need to get from our food to survive. The Earth Science program is also very impressive. We are learning so much about space right now. The videos are informative and the boys are enjoying them. I like that the vocabulary is next and you can not only read the definition, but the word can be read to you so that the kids can learn the proper pronunciation. Needless to say I am very happy with the materials that we have been using. The ease of use for both myself and the boys is awesome. There is not a ton of hoops that I need to jump through to log in. Finding grades is super simple. I literally cannot express how much easier using Standard Deviants Accelerate Homeschool Courses has made planning for the boys. As they get older, I can definitely see us using even more of their courses. Both the boys seem to really like using Standard Deviants Accelerate Homeschool Courses. I am impressed with the ease of use. The information provided. And how much extra research time it has taken off my plate. So the question is, will we continue using it? Yes we are going to continue with Standard Deviants Accelerate Homeschool Courses. I really do think it is worth the extra money. As we get closer and closer to high school, I really like the level of work presented. The easy tracking of materials for a high school transcript is an added benefit. You can choose to assign out the extra writing for the essay questions, or simply allow the students to take the quiz and move on to the next section. Standard Deviants Accelerate Homeschool Courses is perfect for those extra tough subjects as the kids get older. It has put my mind at ease teaching the higher level courses with the kids.